This introduction to the ‘Land of Serendipity’ reveals mountaintop fortresses, ancient capitals hidden in dense forest and national parks where elephants roam free. 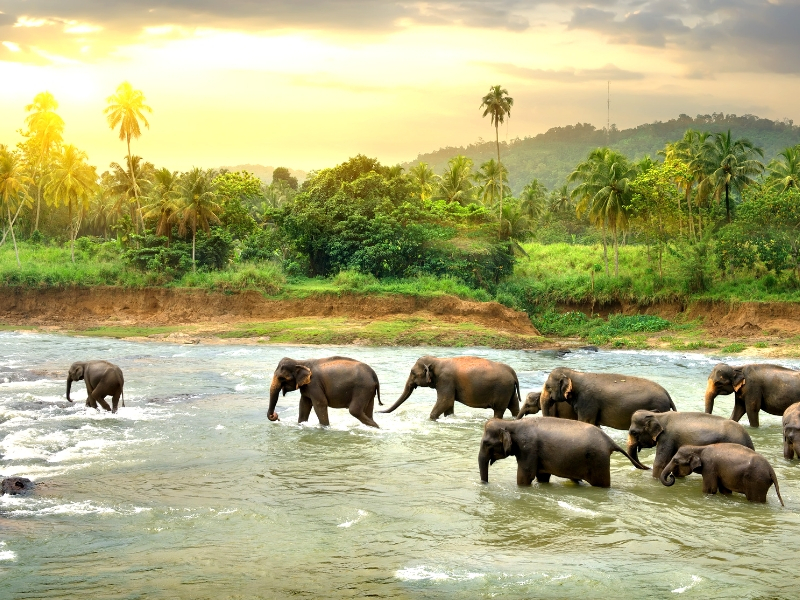 Starting and finishing in the island’s capital, Colombo, you’ll journey to Buddhist temples and botanical gardens, stopping to sample some of the world’s best tea along the way. A safari drive in Yala National Park is a great opportunity to spot Sri Lankan wildlife – we’ll be on the lookout for leopards, buffalo, elephants and crocodiles. Day One: Titan’s VIP door-to-door travel service collects you from home for your flight to Colombo. On arrival in Colombo we transfer to the Cinnamon Lakeside Colombo (4T+), where you are free for the remainder of the day. This flourishing seaport is Sri Lanka’s commercial centre; a curious mix of eastern tradition and western infiltration. Our morning tour includes a visit to the fort built by the Portuguese and a view of the buzzing Pettah bazaar district from our coach, where the streets are crammed with stalls and shops. We continue our journey to Habarana, where we stay at the Cinnamon Lodge (4T+) for three nights. After breakfast, we head to Anuradhapura, ruled by the Sinhalese Kings for over 1,000 years. Star attractions include ancient Buddhist shrines, dagobas (bell-shaped memorials) and pokunas (stone water tanks). We also visit the sacred 2,000-year-old Sri Maha Bodi tree. Later, visit a typical Sri Lankan village for a fascinating introduction to local culture and indigenous farming practices. Further adventure awaits this morning in Sigiriya, a 182m rock plateau on which the 5th century ruler, Kasyapa, built a fortress and palace. The spectacular ‘lion rock’ fortress stands majestically over the lush green jungle surroundings, whilst carved in a niche in the rocks are the famous frescoes of beautiful women. This afternoon you are free to enjoy the beautiful surroundings at the charming Cinnamon Lodge. Or perhaps you may like to join a locally-booked optional excursion to Polonnaruwa. The glamour and wealth of a bygone age are evident in Polonnaruwa, built in the 12th century by King Parakramabahu. The remains of the King’s Palace include shrines, temples, dagobas and the Gal Vihara. Today’s tour takes in a splendid visit to the serene Golden Temple at Dambulla, named for its gilded interior. Marvel at the recumbent figure of the Buddha hewn from solid rock and explore each of the five magical caves that comprise the shrine. We stop at a spice garden before reaching Kandy, last capital of the ancient kings’, which nestles amongst low hills looped by the Mahaweli River. The evening is spent at leisure at the very comfortable Cinnamon Citadel Hotel (4T), our accommodation for the next two nights. This morning’s tour reveals the scenic wonder of the gorgeous Royal Botanical Gardens where you can admire stunning flora and fauna. This evening, watch Kandyan dancers perform the enchanting national dance of Sri Lanka before continuing our journey to the sacred Temple of the Tooth. Tea country’ Victorian and Tudor style homes line the pretty blue lake, adding to its charm. Tea lovers will be in their element on a fabulous tour to a tea plantation, where tea workers, or pluckers, pick each delicate leaf by hand. See the entire manufacturing process, from grading the tea by quality and size through to its final preparation. After relaxing at our night’s accommodation, The Grand Hotel (3T+), we head to the wonderful Colonial Hill Club for High Tea. Our journey continues to the Elephant Transit Home in Udawalawe. Unlike many other sanctuaries, this home rehabilitates orphaned and injured elephants until they are strong and old enough to be released back into the wild. We continue to Cinnamon Wild Yala (4T), where we stay for two nights. We rise early for our safari in Sri Lanka’s best known national park in search of the elusive Sri Lankan leopard. Even if we fail to catch a glimpse of this majestic predator, there is much else to see, including elephants, buffalo, monkeys, deer and crocodiles. Relax at leisure, or perhaps join an optional evening bird trail with an expert local guide. The Old Town of Galle, now a UNESCO World Heritage Site, is the best example of a fortified city built by Europeans in southern Asia. The Portuguese first took control of the city in the early 16th century and began the fortification process, only to surrender it to the Dutch East India Company around 150 years later. The Dutch built substantial ramparts and walls, which are still standing today, and the British, who later controlled the country, left them intact and unchanged. Following our short tour we head to Beruwala for an overnight stay at The Cinnamon Bey Hotel (4T). Today we transfer to Colombo Airport for your return flight to the UK. Upon arrival, your Titan vehicle will be waiting for the journey home.